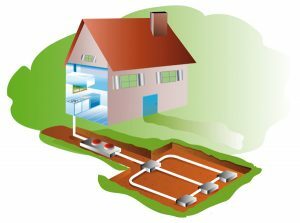 Home / What is Geothermal Energy? When it comes to heating and cooling your home, utilizing the earth’s natural resources is the most efficient, cost effective and environmentally friendly solution available. Geothermal heat pumps take advantage of energy stored in your own backyard to keep your house warm in the winter time and cool in the summer! Compared to ordinary HVAC systems, the geothermal heating and cooling process can save you up to 70% on monthly energy bills – while protecting your family from dangerous carbon monoxide and helping keep the environment clean! Watch this short video to learn more about how geothermal energy can help provide more efficiency and save you money when compared to your existing HVAC system. Click on the image below to start the video. The ground absorbs 47% of the sun’s energy that reaches planet Earth. This amount of energy represents 500 times more than mankind needs every year. planting an acre of trees, or taking two cars off the road. the output of nine new power plants. Current geothermal installations save more than 14 million barrels of crude oil per year.